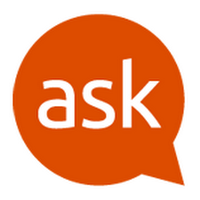 Where can I get the Ask Ubuntu speech bubble logo? Where can I get that speech bubble from Ask Ubuntu in SVG version? I need it for my presentation. You can do a fairly good trace with Inkscape. I'm "attaching" my quick effort but you could easily improve on it if you spent a little time on it. I've left the text in as part of the trace, but you'd probably get a better effect if you just traced the outside of the bubble, filled it in and put "real" text over it. d="m 103.96291,186.72861 c -4.95,0.24556 -11.89774,0.0423 -15.43943,-0.45177 -3.54168,-0.49404 -9.5973,-1.85744 -13.45693,-3.02976 -3.85962,-1.17233 -9.9621,-3.61438 -13.56105,-5.42678 -3.59896,-1.81241 -9.26859,-5.34373 -12.59919,-7.84739 -3.33061,-2.50366 -8.15689,-6.7985 -10.72507,-9.5441 -2.56818,-2.74559 -6.65332,-8.06054 -9.07807,-11.81098 -2.42476,-3.75044 -5.63747,-9.74076 -7.13935,-13.31183 -1.50189,-3.57106 -3.804,-11.56022 -5.11581,-17.75368 -1.31181,-6.19346 -2.3851,-13.19204 -2.3851,-15.5524 0,-2.360363 0.93663,-8.771207 2.0814,-14.246319 1.14478,-5.475113 3.58043,-13.667522 5.41257,-18.205354 1.83214,-4.537832 5.22253,-11.062832 7.53421,-14.5 2.31167,-3.437168 6.51352,-8.657718 9.33743,-11.601222 2.82391,-2.943505 7.38439,-7.014704 10.13439,-9.047103 2.75,-2.03241 6.79036,-4.7321 8.97859,-5.99932 2.18822,-1.267218 7.36322,-3.648968 11.5,-5.292768 4.13677,-1.6438 11.12141,-3.62267 15.52141,-4.39749 4.4,-0.77481 11.20355,-1.40937 15.11901,-1.41012 3.91546,-7.5e-4 11.10962,0.69454 15.98703,1.54509 5.41604,0.94447 12.55098,3.16167 18.32943,5.6959 5.20378,2.2822 12.9549,6.781878 17.22472,9.999278 4.26982,3.217403 9.82141,8.258866 12.33688,11.20325 2.51547,2.944384 6.72796,8.937984 9.36109,13.31911 2.63313,4.381127 5.99522,11.619818 7.4713,16.085981 1.47609,4.466163 3.11475,12.285806 3.64148,17.376984 0.62309,6.022598 0.608,12.664273 -0.0432,19.009953 -0.55048,5.3643 -2.16545,13.24298 -3.58881,17.50817 -1.42336,4.2652 -3.66208,9.60327 -4.97492,11.86237 -2.387,4.10747 -2.387,4.10747 -0.45266,10.5 1.06389,3.5159 3.57114,12.62795 5.57168,20.24901 2.00054,7.62107 3.42814,14.06568 3.17245,14.32138 -0.2557,0.25569 -9.17028,-1.85996 -19.81019,-4.70146 -10.63992,-2.84149 -19.7953,-5.21169 -20.3453,-5.26711 -0.55,-0.0554 -4.04835,1.34672 -7.77411,3.11587 -3.72577,1.76914 -10.47577,4.10347 -15,5.18738 -4.52424,1.08391 -12.27589,2.17166 -17.22589,2.41723 z m -4.5,-55.10906 c 1.925,-0.19719 4.94925,-0.59292 6.72056,-0.8794 1.77131,-0.28649 4.57531,-1.66083 6.23112,-3.05409 1.72298,-1.4498 3.47029,-4.24056 4.0855,-6.5253 0.78381,-2.91083 0.76387,-4.93471 -0.0736,-7.47231 -0.63172,-1.91411 -2.34445,-4.58915 -3.80607,-5.94453 -1.46163,-1.35537 -5.68662,-3.65279 -9.38888,-5.10537 -3.70225,-1.45258 -7.46809,-3.455119 -8.36852,-4.450083 -1.04895,-1.159074 -1.41885,-2.67878 -1.02956,-4.229829 0.34237,-1.364141 1.59446,-2.685247 2.86852,-3.02664 1.24351,-0.333211 3.88129,-0.611982 5.86172,-0.619492 1.98042,-0.0075 5.04089,0.488374 6.80104,1.101965 1.76015,0.613591 3.35089,0.951091 3.53499,0.75 0.18409,-0.201091 0.64281,-2.231589 1.01938,-4.512217 0.68467,-4.146597 0.68467,-4.146597 -6.49167,-5.429079 -5.68907,-1.016694 -8.11694,-1.030909 -11.71495,-0.06859 -2.49624,0.667642 -5.81229,2.120829 -7.369,3.229305 -1.60674,1.144094 -3.3295,3.681301 -3.98487,5.868723 -0.63496,2.119322 -0.85731,5.437345 -0.49411,7.373384 0.41157,2.193833 1.91659,4.623053 3.9946,6.447563 1.83382,1.61012 5.7163,3.78199 8.62773,4.82639 2.91143,1.04439 6.57209,3.09194 8.1348,4.55011 1.5627,1.45817 2.84128,3.11352 2.84128,3.67857 0,0.56505 -0.68038,1.70774 -1.51195,2.53931 -0.83157,0.83157 -3.41907,1.78302 -5.75,2.11434 -2.49976,0.35532 -6.49092,0.004 -9.73067,-0.85697 -4.13217,-1.09789 -5.67643,-1.17044 -6.23469,-0.29291 -0.40814,0.64155 -0.74896,2.61089 -0.75738,4.37631 -0.0137,2.86441 0.38826,3.32043 3.73469,4.23734 2.0625,0.56511 4.875,1.186 6.25,1.37974 1.375,0.19375 4.075,0.19094 6,-0.006 z m -36.89568,-0.64224 c 6.38238,-0.2092 12.11988,-0.69899 12.75,-1.08843 0.79114,-0.48895 1.1452,-6.18258 1.14412,-18.39905 -10e-4,-14.866385 -0.28071,-18.23845 -1.75,-21.119894 -0.96164,-1.885903 -2.87344,-4.233179 -4.24844,-5.216167 -1.375,-0.982989 -4.6331,-2.344632 -7.24022,-3.025874 -3.65613,-0.955349 -6.25944,-0.978389 -11.38309,-0.100746 -3.65358,0.625831 -6.98471,1.505486 -7.40252,1.954789 -0.41782,0.449302 -0.53204,2.278127 -0.25384,4.064055 0.50583,3.247143 0.50583,3.247143 8.64275,2.627578 7.04324,-0.53629 8.44597,-0.367894 10.43627,1.252858 1.26464,1.029832 2.66852,3.510098 3.11972,5.511702 0.82036,3.639279 0.82036,3.639279 -6.29936,3.558899 -3.91584,-0.0442 -8.78472,0.48309 -10.81973,1.17178 -2.03501,0.68868 -5.07251,2.81533 -6.75,4.72589 -2.66139,3.03116 -3.04998,4.22398 -3.04998,9.36222 0,4.93863 0.43559,6.40615 2.70042,9.09775 1.48523,1.7651 4.07273,3.83786 5.75,4.60614 2.23194,1.02234 6.16087,1.29488 14.6539,1.0165 z m -2.10432,-7.80519 c -1.925,0.008 -5.0412,-0.52326 -6.92489,-1.17971 -2.31348,-0.80624 -3.72316,-2.09637 -4.34402,-3.9756 -0.67689,-2.04884 -0.51687,-3.39596 0.60717,-5.11146 0.83946,-1.28117 2.96301,-2.61676 4.71901,-2.96795 1.756,-0.3512 4.82398,-0.63166 6.81773,-0.62324 1.99375,0.008 4.075,0.34592 4.625,0.75 0.55,0.40408 1,3.20969 1,6.23469 0,3.92013 -0.43088,5.69525 -1.5,6.17971 -0.825,0.37385 -3.075,0.68595 -5,0.69356 z m 67.96617,7.12673 c 4.96617,0 4.96617,0 5.25,-10.66342 0.28383,-10.66342 0.28383,-10.66342 6.5399,-4.34527 3.44084,3.47499 7.49084,8.27273 9,10.66164 2.6685,4.22408 2.88824,4.34352 7.99393,4.34526 3.81619,0.001 5.25,-0.37783 5.25,-1.3882 0,-0.7645 -2.05045,-4.17533 -4.55655,-7.57962 -2.5061,-3.4043 -6.98608,-8.69799 -9.95552,-11.76376 -5.39897,-5.57414 -5.39897,-5.57414 4.20834,-15.670383 9.60731,-10.096246 9.60731,-10.096246 3.96048,-10.396002 -5.64683,-0.299756 -5.64683,-0.299756 -14.11362,8.5 -8.46679,8.799755 -8.46679,8.799755 -8.50496,-11.578052 -0.0382,-20.377808 -0.0382,-20.377808 -4.19279,-19.713458 -2.28504,0.365392 -4.53504,0.899464 -5,1.186825 -0.46496,0.287361 -0.84538,15.795917 -0.84538,34.463458 0,33.940982 0,33.940982 4.96617,33.940982 z"
I've made a proper SVG version of the logo. It is in 512x512. The logo is still intellectual property of Stack Exchange inc.
d="m 344.46203,255.6738 c 0,16.04488 -4.3246,31.0797 -11.87177,44.00243 6.07959,23.82733 11.81397,44.09695 11.81397,44.09695 0,0 -22.84734,-6.44552 -43.04488,-12.75311 -12.9838,7.64611 -28.11748,12.03192 -44.27552,12.03192 -48.25764,0 -87.37819,-39.12055 -87.37819,-87.37819 0,-48.25765 39.12055,-87.3782 87.37819,-87.3782 48.25765,0 87.3782,39.12055 87.3782,87.3782 z"
Where should I post complicated questions that are about Ubuntu?